Are Aurora Cannabis and Cronos Group Stock Worth Owning in 2019? These two popular Canadian pot stocks may disappoint investors in 2019. Here's why. Cannabis stocks had a banner year in 2018. And thanks to a surfeit of landmark developments -- such as the legalization of recreational marijuana in Canada, Mexico's slow but steady march toward legalization, and Thailand's decision to suddenly decriminalize medical marijuana at the tail end of the year -- this emerging growth industry appears to be on solid footing heading into 2019. Still, investors may want to think twice before diving headfirst into this so-called "green rush." After all, the largest market in North America -- the United States -- remains off-limits for pioneers like Canada's Aurora Cannabis Inc. (TSX:ACB) (NYSE:ACB) and Cronos Group (TSX:CRON) (NASDAQ:CRON). And that situation won't change until marijuana is decriminalized at the federal level. Equally as problematic, these top Canadian producers have yet to even ramp up production levels to the point were they can adequately meet domestic demand, keeping them from being cash flow positive on a consistent basis. While these two key headwinds are likely to fade with the passing of time, they're certainly going to shape the industry's near-term outlook. With this theme in mind, let's consider if either of these top pot stocks belong in your portfolio in 2019. Aurora, as a company, went through a major metamorphosis in 2018. Through a series of seminal acquisitions that included CanniMed Therapeutics, ICC Labs Inc., as well as MedReleaf, Aurora greatly expanded its international footprint, production capabilities, and product offerings. As a result, Aurora has become the largest cannabis player in Europe. It brought several top-selling recreational products to market in Canada last year and has established a solid product line in the all-important medical cannabis segment. Most importantly, though, Aurora is now on pace to achieve an industry-best production output of 700,000 kilograms per year within the next few years, thanks in no small part to management's ultra-aggressive business-development strategy. The big deal is that Aurora should have the scale necessary to meet its ambitious international expansion. The company's enormous projected production capacity should also translate into a significant cost advantage over the broader field of cannabis producers. In fact, the company expects production costs to drop below 1 Canadian dollar once all of its facilities become fully functional. What's the verdict? Aurora certainly has a bright future ahead of it. But this stock arguably doesn't belong in your portfolio until management finds a way to fund the company's growth-by-acquisition strategy without continually diluting current shareholders. With a pro forma production capacity of only 117,150 kilograms per year, Cronos Group certainly doesn't sport the same type of economy of scale as Aurora. But the company has other unique strengths that could make it a worthwhile investment. First up, Cronos inked an enormous partnering deal with American tobacco giant Altria late last year. This deal transformed Cronos into one of the healthiest cannabis companies in the game from a financial perspective. As a result, Cronos now can accelerate the build-out of its production facilities and pursue licensing deals of its own without having to tap the public markets. Additionally, Altria's vast infrastructure and regulatory expertise should give Cronos a distinct competitive advantage in the multibillion-dollar American cannabis market, if and when lawmakers end federal prohibition. That fact alone sets Cronos apart from the rather crowded field of Canadian cannabis stocks. Cronos' recent partnering deal with Ginkgo Bioworks to produce rare cannabinoids on a commercial scale also has the potential to differentiate this company from the pack. In short, this novel collaboration could result in the development of a host of secondary cannabis products over the next three to four years -- possibly opening up an untapped multibillion-dollar marketplace in the process. All that being said, Cronos' near-term valuation is anything but appealing from a classic value-investing paradigm. At 16.7 times its 2019 projected sales, after all, Cronos stock is currently among the most expensive in all of healthcare. What's the bottom line? 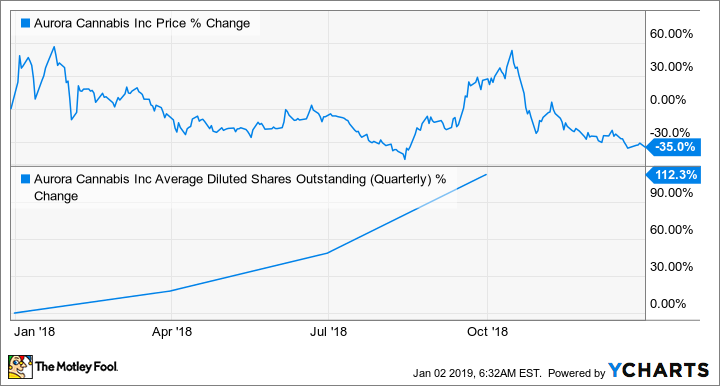 Cronos shares probably are going to struggle this year because of its premium valuation and lack of near-term growth drivers. The primary headwind is that Cronos' value proposition centers around its long-term projects with Altria and Ginkgo -- neither of which is likely to bear fruit this year. As such, this pot stock probably doesn't belong in your portfolio this year, either.